Research and Development Team at Behavior Interventions Inc.
Tim Caldwell serves as the Director of Research and Development for Behavior Interventions Inc., overseeing the behavioral research and clinical development of ABA-based intervention throughout central and eastern Pennsylvania. Tim completed his Ph.D. in Applied Behavior Analysis in January of 2019 at The Chicago School of Professional Psychology. His main areas of clinical work include development of staff training and programming implementation systems, as well as ongoing supervision of BCBA candidates and BCBA’s. 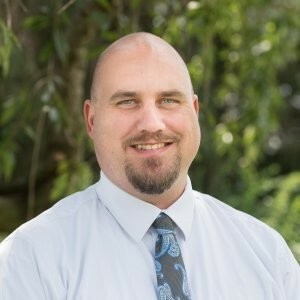 His research interests include, staff training, parent training, advanced verbal behavior, derived relational responding, stimulus equivalence, verbal self-prompting, and verbal problem-solving. Tim’s research has included an analysis of script training to teach recall of past events and the examination of stimulus equivalence technology to improve parent training outcomes. In addition, Tim has served on the Board of Directors of Mental Health America Lancaster County from 2008-2014, including serving as Board President, 2012-2014. Tim also currently serves on the PennABA Executive Council as the Central Region Member at Large and on the Penn State Harrisburg ABA Master’s Advisory Board.